"Like" the official Company of Heroes 2 Facebook page to receive a free beta code for the currently underway public beta. It looks like developer Relic is keen to get some stress testing done for its upcoming RTS Company of Heroes 2, offering up free beta codes for anyone who "likes" the official Company of Heroes 2 Facebook page. Clicking the giant "like" button right under the quote that claims the first Company of Heroes game was "the highest rated strategy game of all time," will reward you with a download code, which you can use to download the "beta stress test" client and join the already underway public beta. Six maps are available to play on during the beta, which started earlier this month for pre-order customers, giving you a taste of 1v1, 2v2, 3v3 and 4v4 multiplayer. Comp-stomps (playing vs. the AI) are also working in the beta, as is the army customizer tool. The first 40 levels of progression have been unlocked for testing. The beta is currently only available on Steam, although the retail version of the game will also be available on EA's Origin platform. 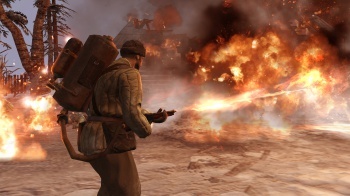 Company of Heroes 2 is the sequel to the critically acclaimed (although probably not the "highest rated strategy game of all time," according to Metacritic that's Command and Conquer) Company of Heroes. While the first game focused on the "western front," of WW2, which was between mostly American and German troops, the sequel will focus on the "eastern front," the theater of war that involved Russian and German forces. Relic previously detailed pre-order bonuses for the game, offering a range of goodies depending on what version of the game you bought (standard or collector's) and where you bought it from. At the moment, it looks like the Steam version of the collector's edition has the biggest loot bag. The game will be released on June 26th.